Early on in Todd Haynes’ Carol (2015) the two protagonists catch sight of each other across the Christmas toy display in a 1950s department store. From this interlocking of gazes—the first of many—between diffident young store clerk Therese Belivet (Rooney Mara) and sophisticated matron Carol (Cate Blanchett), an intrigue develops apace; the younger woman pulled along in the other’s slipstream with such rapidity (“I always say yes to everything,” Therese says much later on) that we have no choice but to accept their burning attraction as a fait accompli. 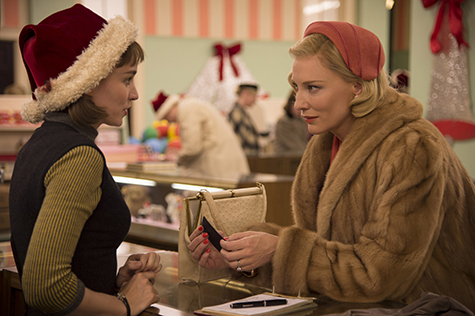 While Haynes has stressed his intention for Carol to be purely a love story rather than an ‘issues-based’ film, all the obstacles to Therese and Carol’s love are external ones springing from attitudes at a time when male homosexuality was criminalised and lesbians were considered mentally ill. Carol becomes hostage to her resentful soon-to-be ex-husband who threatens to withhold access to her daughter should she continue her involvements with women. The relationship between Carol and Therese itself is not internally conflicted, however. It is one of unadulterated passion, a little stiffly negotiated initially given the formality of the period, but always moving towards a destination of high romance. Carol and Therese are unequivocally in love, so why does their relationship feel so null? It’s not for lack of commitment on the actors’ part. Blanchett’s every gesture (the raising of the hand to the hair, the arch sideways glance), her every low-cadenced utterance is weighed and considered in a mannered performance that recalls her role in Blue Jasmine (2013), as another woman attempting to shrug off her past, with that film’s theatrical echoes of A Streetcar Named Desire. It’s a style of acting that draws attention away from the couple’s interactions and towards its own evocation of 50s femininity. Mara’s Therèse is terse, curious and wide-eyed, not yet quite at ease with herself, in contrast to the experienced Carol. The uneven dynamic between the two at times causes Blanchett’s character to seem faintly predatory; something I assume was unintentional. But beyond these performative quirks, a more fundamental issue arises, something that’s crucial to films depicting love—how do filmmakers and actors go about conveying chemistry between characters? In this aspect it seems pertinent to compare Carol to another rare mainstream lesbian love story with similar themes of self-discovery. The chemistry between Adèle and Emma in Blue is the Warmest Colour (Abdellatif Kechiche, 2013) comes across as vivid and heady. This might be because Blue is the Warmest Colour takes more time building up a sense of Adèle’s nature and circumstances so that when she first encounters Emma we can understand what has led her to fall for that character. Or maybe it’s due to the point-of-view cinematography that immerses us in Adèle’s world. Then again, as in life, perhaps chemistry is a simple matter of chance. Carol is in almost every respect polished, considered cinema, its re-creation of the human dramas playing out in a stultifying era eloquent—but where is its beating heart?